Melikset Khachiyan began playing chess at the age of 8, won the Baku Junior Championship two years later and became a Soviet Candidate Master two years after that. He began coaching early in his career and has brought up three Junior World Champions. In 2001, he immigrated to the U.S., where he participated in the National Open in Las Vegas. He earned his Grandmaster title in 2006. 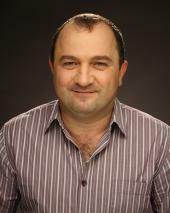 Khachiyan has been playing and coaching chess professionally since 1990. One of his students, GM Levon Aronian, said: " ... it was Khachiyan who took me as a third-category player and made me an IM." When Melik was young, he had the distinct honor of being coached by the 12th World Champion, Tigran Petrosian. Then, in 1995, he earned the title of International Master. Melik continued coaching strong players and playing in strong tournaments, both of which he credits to the improvement of his game. In 1996, he played for the Armenian team in the World Chess Olympiad in Erevan, Armenia. The next year, Melik helped the Armenian team earn a bronze medal at the World Team Championship. Melik was extended a wildcard to the 2013 U.S. Championships primarily because of his fantastic results over the past year. He has gained almost 100 rating points since 2011, which demonstrates his remarkable fighting spirit. Khachiyan is one of the more dynamic fighting players at this year's event, and his presence is sure to create some exciting over-the-board struggles.